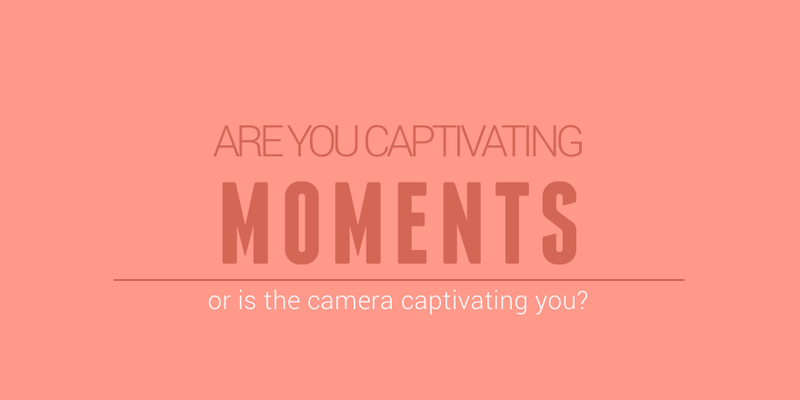 Are you captivating moments? - Or is the camera captivating you? One of our strengths as heart-centred teachers is that we are deeply reflective. "the most dangerous phrase in [our] language is 'we've always done it this way'"! Fortunately the tendency for improvement is innate in our team. At times we are looking for inspiration and at other times it finds us. Being perceptive, we notice things around us and grasp onto thought provoking experiences or words. We value the triggers that cause us to pause and think. The smallest 'noticing' may end up being an epiphany moment which causes us to re-look at an area of our practice or a path we've inadvertently gone down. Is the camera holding you captive? A recent experience with a flat digital camera provided us with deep food for thought. No photos could be taken that session, and at the end of the morning we realised the session had a different feel to it. We felt different, and in fact, we felt liberated! Instead of capturing moments with a click of a button, we collected them with the naked eye. We recorded them on paper. We trusted in our ability to recall the days events without digital recordings, the same way we all did when we entered teaching well over a decade ago. We realised that as strong as our observation skills are, we are often observing through the lens of a camera. Photos are of course not a bad thing, and we certainly use them in our documentation, social media presence and publications and we know that a photo can 'paint a thousand words'. Yet in reflection we can also acknowledge that observation without photos is pure, and can capture the intricacies of facial expressions and hand movements. If we do it well, our words alone can provide a beautiful description that you not only 'see' but feel. When grabbing a camera becomes a default setting, there is a mindlessness to it. It acts as a barrier to being present. Whether it be as a teacher, a parent or a traveller, the camera stops us from being fully engaged in what is happening before us. We wont be throwing the cameras out entirely. What we will be doing is being far more mindful about our use of them. We will ask ourselves if a camera is the only way to capture this experience? Sometimes it will be yes, and yet we may surprise ourselves with how often the answer is no. We hope to discover that less is more, and that being less 'snap happy' will enhance what we do and certainly not retract from it. We move ahead with purpose. The beauty of teaching from a heart place is admitting that we too are on a learning journey, and continually have growing to do. Our place is a place for learners to strive and be nurtured - teachers included!